Death Rays in London - This title was chosen by the English media, after the 37-story building in 20 Fenchurch Street, that has a concave facade, focused the sun rays to such an intensity that the plastic parts of a car parked on the opposite side of the road melted. Next to visible light also a good share of infrared irradiation is reflected. The problem was solved with the installation of horizontal blades over the whole facade - a cost factor that had not been factored in - even the molten Jagua XJ seemed cheap in comparison. The 57-story Vdara Hotel on the strip in Las Vegas was focusing sunrays on its pool area melting plastic and scorching hair. Interestingly the problem had been anticipated and thought to be solved by the application of a special high-tech foil on 3000 glass panels, which at the end was not enough to reduce the irradiation to normal levels. In Germany, too, the sun reflections of some buildings have caught the attention of the media. In Freiburg the facade of the university library has been equipped with mirror glass. Together with the slanted facade this fact caused a dazzling glare for car drivers and users of the near bicycle path. To avoid this ever year during summer, 250m² of the glass facade need to be covered by a drapery on the outside. Almost every glass surface reflects light. Typically, only a small share of sunlight is reflected, but this small percentage can already lead to dazzling of neighbours or road- and railroad traffic. Solar Glare Assessments already had an essential impact on the planning of solar plants - their panels also have a glass surface - but also Glass Facades have reportedly caused glaring hazards to traffic, resulting in necessary adaptations of the facade. 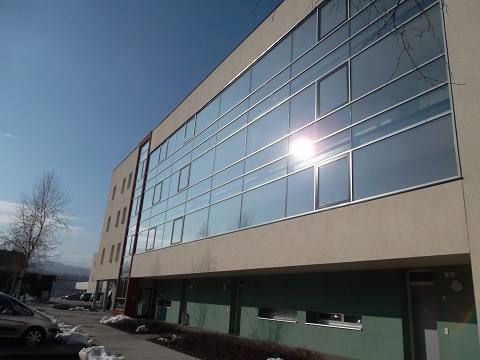 A Solar Glare Assessment, also Glint and Glare Study will inform about a building's potential to reflect sunlight towards critical points before it is built. In a simulation several important parameters of the sun's reflections are obtained such as duration and time of the exposure, directions or the sunrays and intensity of the glare. The study typically also contains an evaluation of the glare (not all glare is dangerous) as well as counter measures if needed. Buildings' facades are typically vertical. This means that they can be seen from far. The fact that the reflected sun elevation angle does not change, is an advantage in this case, because it will not cause horizontal deflections (as opposed to solar panels, which are typically installed with a slope). Complex shapes of building facades can cause focusing of the sunlight and thus be the reason for material damage, as it happened in some infamous examples above. In order to keep the air conditioning costs low, heat-reflecting glass is used frequently for large glass facades. Its reflectance for infrared irradiation can be much higher than for visible light, thus having a higher heat impact on outside targets. How to obtain a Glare Assessment ? 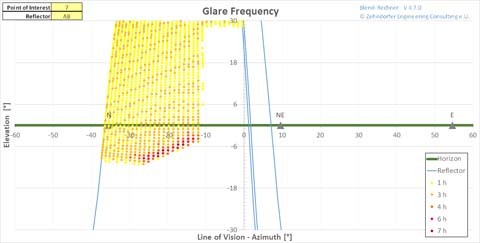 Only a few parameters are needed for the calculation of the Solar Glare of your building facade. ...a building glare assessment next to a highway.